BB&T Home Mortgage Reviews - Right Mortgage Lender for You? BB&T mortgages cover all the major federal and conventional programs, as well as programs designed to make homeownership easier for first-time homebuyers and those who don’t have the money for a traditional 20% down payment. BB&T Bank is based in Winston-Salem, N.C. and is one of the top-rated lenders for customer satisfaction. The key to figuring out if BB&T is the right mortgage lender for you – trust us, there are hundreds – is a matter of understanding which products they offer, how those products match up with your situation and how others rate BB&T’s customer service. Our review is going to focus on those areas by giving you an overview of the mortgages the company offers, some recommendations on which mortgages are best for you and how BB&T ranks against other lenders when it comes to customer service. In this section, we’ll elaborate a bit on each of these mortgages. “Fixed-rate” refers to the fact that your interest rate is fixed for the life of your loan. Your interest and principal payments will be the same amount every month. As time goes on, though, the amount of your monthly payments that goes toward interest will decrease and the amount going toward your principal will increase. Banks do this so that they get the big interest payments up-front, thereby reducing their risk because they’re getting paid sooner than later. These mortgages start out with a period of fixed-rate interest and then change to an interest rate that varies depending on the type of adjustable-rate mortgage (ARM) you get. For example, a 5/1 ARM means you’re getting a mortgage that has a fixed interest rate for five years (5) and then the variable rate kicks in and it changes every year (1). A 3/3 ARM means you get a fixed rate for three years and, after that, your interest rate changes every three years. Exactly which interest rate you get depends on the prime rate, which is an interest rate the Federal Reserve determines. It’s like a baseline for everything that has an interest rate: mortgages, car loans, credit cards, etc. These loans tend to have lower interest rates for the fixed period but, when the economy is good and interest rates rate rising, the variable rate tends to exceed what you would’ve paid for a fixed-rate mortgage. These mortgages are designed for those who want to build a primary or secondary home or do major renovations to their existing home. What BB&T Offers allows you to borrow money you can use to pay for the land and the construction of the home. According to BB&T, some of the key features of these mortgages are that you can buy the land on which you’ll build your home, which is a necessity for new construction and, you can get interest-only payments. An interest-only loan means you’re paying only the interest, not the principal and interest. This results in lower payments and provides a bit of breathing room for you every month as your new-home construction or renovations demand a big chunk of your financial resources. These types of mortgages are excellent for you in pretty much every situation, but they’re a big help if you’re buying your first home and you don’t have enough in your savings to pay for a down payment and closing costs. For that reason, these tend to be good fits for first-time homebuyers. 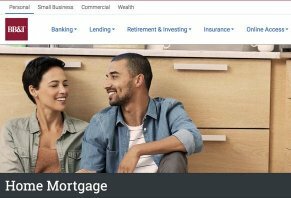 One of the most popular national programs that appears in BB&T’s mortgage lineup is the FHA mortgage, a product that the Federal Housing Administration offers. As we point out in our guide to first-time homebuyer mortgages, FHA loans require a 3.5% down payment and accept borrowers with credit scores as low as 580. The drawback to these loans is that you have to keep something called “mortgage insurance” for the life of the loan. This is something you pay each month that protects the FHA just in case you stop paying your mortgage payments. This insurance typically requires monthly payments that are 1-2% of your mortgage divided by 12. The bank also provides HomeNow and CHIP mortgages. The HomeNow mortgage is part of a program in which you can get favorable loan terms if you’re buying a home in Montana or Idaho. The community housing improvement program (CHIP) provides mortgages for owners of single-family homes who want to buy a home or renovate their existing home. If you’re buying a home, one of the requirements is that your income cannot exceed 80% of the area median income. USDA loans are part of a program from the Department of Agriculture whose purpose is to encourage people to live in and contribute to rural communities. These mortgages can be great but they come with a series of restrictions that may make them a poor option for you. For example, because they’re designed to contribute to rural communities, you can’t use the mortgage to buy a home in an urban area. Exactly which areas are urban and which aren’t is something you can determine from checking the program’s eligibility map. Also, there are caps on how much you can earn, how expensive the house is and what your credit score has to be. These mortgages come from the Veterans Administration federal office and are designed to help members of the military (active duty, retired, reserve, National Guard) who meet certain requirements. These loans have two important features: no down payments for those who qualify and no mortgage insurance, both of which create less of a financial burden for the homebuyer. The final category of mortgage you can get from BB&T are loans and lines of credit that are related to the equity in your home. Your equity is the value of your home minus what you owe on your mortgage. If your home is appraised at $300,000 and you owe $200,000, your equity is $100,000. A home equity loan is one that has a fixed interest rate and is up to between 80% and 90% of your equity. The line of credit is different in that you’re approved for an amount that acts as like a credit card limit does. You can withdraw the money if you want, but you don’t have to. You typically have 10 years to draw from that credit line. After that, you’re responsible to pay back any leftover balance you didn’t pay off during the draw period. What you have to remember is that these are mortgages – BB&T can foreclose on your home if you don’t repay what you borrower. Knowing which mortgage is right for you is a matter of taking some time to look at the options BB&T gives you. While there may be a mortgage you like, you aren’t guaranteed to get it. For example, if you’re a member of the military and you’re approved for a VA loan, you might actually get a better ate and, in the long term, save more money if you went with another loan not tailored to the military. In general, though, we think that the CHIP loans and BB&T renovation loans will be your go-to mortgages if you’re a low- to middle-income family looking for a way to renovate their home. FHA loans are excellent if you want a low down payment, but the fact that you’ll always have mortgage insurance means you’ll pay more each month over time to compensate for what you didn’t pay up front. We want to remind you, though, that this advice is general and doesn’t apply to every borrower in every situation. You should work with your loan officer to find a solution that is most comfortable for your financial position. Every year, J.D. Power, a consumer research firm, releases the results of their mortgage originator customer satisfaction survey. These results provide summary rankings of the country’s major mortgage lenders. Each lender gets a score of between 1 and 1,000, a circle rating based on the lender’s performance across five to six categories. In J.D. Power’s 2017 survey, they ranked BB&T #9 out of 23 lenders who lend to all and not just members of the military. J.D. Power says that their 3-circle ratings mean that the lender performed about average. So, while there’s nothing that stands out about BB&T’s ratings, you’ll know that the treatment you get is going to be on par with some of the big-name banks like Bank of American and better than Chase, Wells Fargo, and Citi. Is BB&T the Right Mortgage Lender for You? Based on our research, we believe that BB&T strength is that it offers a variety of ways for homeowners to get money for home renovations, provided they can qualify for programs like CHIP or for BB&T’s home equity loans and lines of credit. We also think their USDA mortgages could be a great help for those who don’t need to live in a metropolitan area. As far as downsides go, we believe that homebuyers who are comfortable getting a mortgage online will more than likely get better customer service with Quicken Loans, according to J.D. Power, who ranked Quicken tied for first out of 23 lenders. However, just because Quicken has better customer satisfaction ratings doesn’t mean you won’t enjoy your BB&T experience. Our suggestion is to try multiple lenders to find out which sites or banks can give you the best rates for your particular situation. Write a Review for BB&T Home Mortgage!